In the meantime, Apple has advised authorized service providers to instruct customers to restart the affected iPhone 7 or iPhone 7 Plus. 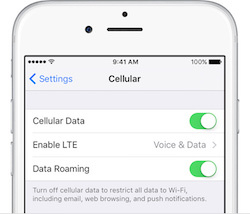 If no service persists, Apple advises customers to remove and re-insert the device's SIM card. In a video shared with MacRumors by reader Yasser El-Haggan, an iPhone 7 can be seen with no service alongside an iPhone 6s with two bars of LTE after Airplane Mode is toggled off on both devices. Both of the iPhones are said to be AT&T models, which means the iPhone 7 has an Intel modem rather than a Qualcomm modem used for Verizon and Sprint models. All of a sudden today my iPhone 7 Jet Black model started not getting internet service -- can’t make outbound calls or receive calls -- even though it showed 4 bars. I then put it in Airplane Mode, and back off, then it showed no service. It got pretty warm in the top right hand corner. I then took a video of my wife's iPhone 6s right next to my iPhone 7, put them both in Airplane Mode, and then switched Airplane Mode off and you can see immediately that the iPhone 6s gets signal instantly, and the iPhone 7 just sits there searching. I then took her SIM and put it in my iPhone 7, no luck, put my SIM in her phone, and it got signal right away. El-Haggan said he took his iPhone 7 to an Apple Store, where the Genius Bar swapped out the device with a new one. The employee had allegedly seen the issue on a few previous handsets, and he immediately replaced the device per Apple's instructions in lieu of running a basic diagnostic test. Apple appears to have replacement iPhone 7 models reserved for these scenarios per standard policy. AIRPLANE GATE EVERYONE STAY CALM! Not to be confused with the Galaxy Note 7 airplane gate that doesn't let you take them on planes. Does this hissing stop when this happens? Maybe it's a feature. Sounds courageous to me. This is ridiculous Apple. QC is in the gutter for the last few years at Apple. Wouldn't be an iPhone launch if there weren't multiple bugs that people try to blow out of proportion. This is no bug. It is the second phase of the Beta testing. Code name the Gamma Phase, a.k.a "Field Test"
Maybe Airplane mode is looking for an AirPort router to land on. And not enjoy a great phone for an entire year? Just get a replacement at the Apple Store or through AppleCare. Living in fear of a few bugs is no way to live. And yes, I upgrade every year and don't have problems Apple's service team haven't fixed. Have the same behavior after upgrading to iOS 10 on an iPhone 6S Plus. Not 7 specific. Yes, we should all switch to Samsung. Could you imagine them making such a large QC gaffe as this? I find it remarkable that nowadays a lot of - seemingly hardware issues - are fixable by firmware updates. Let's hope this one is one of them. It likely is. Remember this is the first time Apple (or any major OEM) is using Intel modems in a high volume phone. My guess is that this is a simple software or firmware glitch.
" the iPhone 7 has an Intel modem ('https://www.macrumors.com/2016/09/16/iphone-7-chipworks-teardown/') rather than a Qualcomm modem ('https://www.macrumors.com/2016/09/08/att-and-tmobile-iphone-7-models-lack-cdma/') used for Verizon and Sprint models." Hold it, I thought the only difference these days was the SIM card. I bought my last phone (6) directly from Apple as a generic phone and used my SIM card from Verizon. I was really tired of all that locking stuff (although my previous Verizon phone wasn't locked) and wanted to be free from contracts with the phone carrier. The iPhone 7 has gone back to having different modems for different carriers. I'm not a fan of this.